Here is some basic advice on Craps play that should give you a more profitable game and help you avoid the fundamental mistakes that many inexperienced gamblers make. There are some bets on a casino Craps table that you should NEVER make because an equivalent bet can be made elsewhere that offers better odds. The Big 6, Big 8 bets should never be used because an equivalent Lay Bet on 6 or 8 pays 7 to 6 instead of 1 to 1. 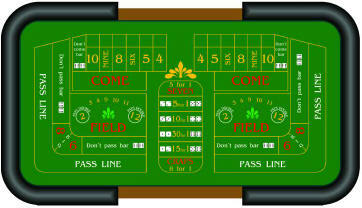 The proposition bets placed in the centre of the table's layout, which are made through the dealer, should be avoided at all costs. They have a huge House edge and you'll soon get through your bankroll if you play these. If you take a look at the odds for Craps you'll see that some bets have a significantly greater House edge than others. Many serious gamblers won't make bets with an edge of greater than 2% against them. This leaves the Pass Line, Don't Pass, Come, Don't Come, and Place bets on 6 and 8. You can make any of these bets and be sure you have a reasonable chance of winning - that is a slightly less than 50/50 chance. If you really feel lucky and want to take a big risk, you could consider placing your money on a Lay Bet on 6 or 10, or possibly a Field Bet. These bets have a house edge of greater than 2% but less than 3%. As you should know there are no winning systems for Craps but you can reduce the house edge to something very small if you make smart bets. Casinos don't like this kind of play because of the small percentage they have. Here is a system which reduces the house edge to 0.848%. Place your bet on the Pass Line before a come out throw. If the shooter throws a natural or craps, bet on the Pass Line again. If a point number is thrown place another bet on the point number. For the next roll of the dice bet on a Come and if a point is thrown place a bet on the point number. You'll get correct odds on the point number because the casino gives true odds when you bet on a Come or Pass at the same time. Your bets will have to be the minimum for the table. If you want an even smaller edge against you (0.832%) bet the Pass Line and Don't Come and lay the free odds.